The Xmas Butter Cake is a basic butter cake. 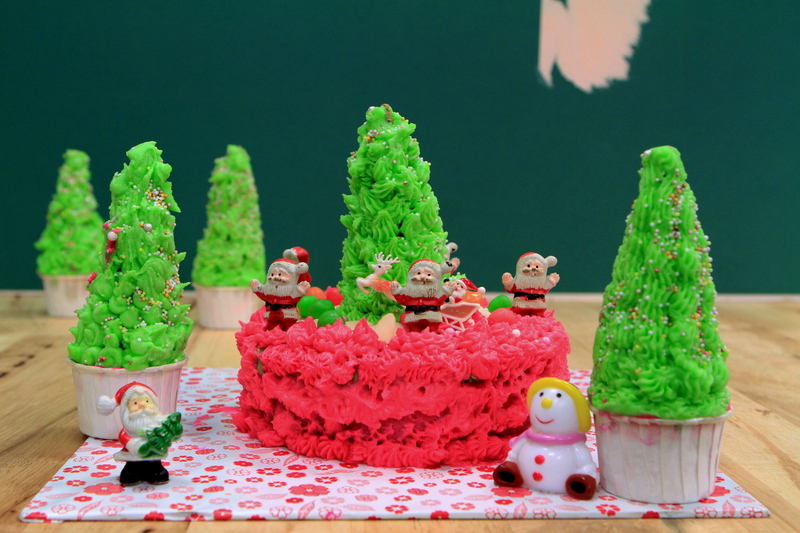 What makes it special is that you can decorate it creatively using festive colours and decorations. In a bowl, mix all the dry Ingredients: flour, sugar, baking powder and salt. Use a mixer to combine eggs, sugar, butter, vanilla essence, milk and oil. Pour wet ingredient into the dry ingredients and mix well. Grease a 9 inch pan and pour the mixture into the pan. Bake for 35 minutes. Let the cake cool. Cut cold butter into cubes and mix icing sugar in a mixer. Once it is mixed well, add salt and vanilla essence. Divide the mix into two potions. Colour one portion with red colouring and the other with green. Pipe the green colour on to the ice cream cones to make them look like trees. Pipe the cake with the red colouring. Decorate the cake creatively.